Rocksteady's newest installment and final chapter in the Arkham series will certainly be a must have game for next-gen console owners. Batman: Arkham Knight was originally scheduled to release next month on October 14, 2014. However, due to many "unfinished details" the developers of the game, Rocksteady, have felt that this is the best move to make based on the progression of the game in it's current state. Players will have to wait until next year in order to get their hands on one of the most highly anticipated games of 2015. Let's start off by looking at the most interesting details the game has to offer. Many have questioned the motives for Rocksteady's decision on the delay. Gamers will not be able to experience one of the most iconic games in terms of next-gen consoles this year, however the developers have already commented that the wait will be well worth it. "We just want to make this the best experience that we can, and that takes time, ... We feel that we have an absolutely awesome game in the works, and we want to make it as great as it possibly can be. We just need more time to do that. If we didn't give the team more time to do it, then we would be releasing something that we weren't happy with. We want to make sure we're absolutely nailing it 100 percent." Interestingly enough, Arkham Knight, despite the delay has already been praised for the exciting storyline by many critics. The game has received numerous awards such as Game Informers "Best Action Game", Game Critic's "Best Action Game/Adventure Game of 2014", and IGN's "Best Xbox One Game". If that hasn't make you want to get Arkham Knight yet, let's take a look at some of the gameplay features. Set after one year after after the events of Arkam City, the player takes control in a third person perspective of the masked crusader once again. A brand new set of tasks will emerge and it will be up to Batman to stop Gotham from falling into it's doom. The size of Gotham will be expanded as marketing manager Guy Perkins commented, "Gotham City is five times larger than the game world of Arkham City". New villains have already been confirmed by Rocksteady as well as the returning ones. Characters such as The Penguin, Scarecrow, Two-Face, The Riddler, and Harley Quinn will be making a return in Arkham Knight. One of the other characters to be included in the game will be Red Hood whom alongside Harley will be available as playable characters through pre-order. 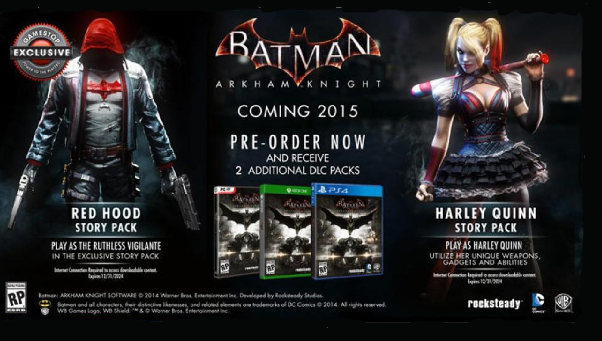 Ironically, the title of the game Arkham Knight does not refer to Batman himself, but to a brand new foe. The Arkham Knight is described as "militarized" version of Batman, and makes his first appearance in the Batman franchise. No other known features have been released pertaining the antagonist's role in the game. "The Batmobile is one thing we just couldn't do on previous gen. It's not just a case of having a car, it's a case of building a city where the car feels at home.. Not only that, but the detailed character models for Batman: Arkham Knight would be too much for last-generation hardware". Batman: Arkham Knight will be officially released on June 02, 2015. Rocksteady had confirmed that Arkham Knight will making its way to the Xbox One, PS4, and the PC. What do you think about the "explosive finale" to the Arkham series? Will it be on your list of Xbox One games to buy?